Retail and other traditionally single-use developers are increasingly teaming up with partners to do mixed-use projects. 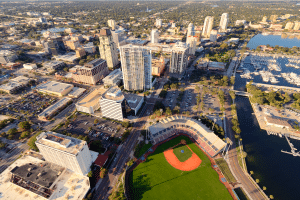 “Across the country, we’re working on a lot more projects that have a robust mix of uses,” said Michael Harris, managing director of St. Petersburg, Fla.–based CREModels, a real-estate analytics firm. “Developers that used to focus on just one sector, like retail or office, are now bringing in apartments, hotel, condos, restaurants, entertainment uses, you name it. If you want to stay in development these days, you almost have to do mixed-use in order to get deals to pencil out and to get investors and tenants interested.” But mixed-use projects and related partnerships can be more complicated than developing, say, a hotel or a grocery-anchored shopping center alone. SCT asked developers and consultants with experience in mixed-use to offer advice on ways that partners from diverse sectors — retail, multifamily, office and others — can effectively collaborate on these projects. Here are those tips. This year ICSC Research published a two-part series on a range of considerations in mixed-use development, notes Michael Tubridy, managing editor of research. In the first installment, titled The Economics of Place-Making: How to Blend Residential Uses Into the Retail and Services Mix, economist and strategy consultant Jerry Hoffman discusses how to turn smaller regional malls into mixed-use centers. The report brings a redevelopment-related focus on ownership issues, leasing dynamics and more. The next report — Mixed-Use Center Conversions, Part II: Achieving Optimal Market Position — offers four case studies to elucidate the process. “These reports should help any retail developers who are thinking of adding nonretail uses to their properties, as well as those who are partnering on mixed-use projects for the first time,” said Tubridy. The principals of Preston Development Co. were patient, and then some, in their search for the right partners to build a gateway mixed-use project for the Chatham Park master-planned community, a 7,100-acre project to go up near Raleigh-Durham, N.C. “We searched long and hard for about six years to find partners we could team up with that would design [the mixed-use project] we wanted,” said Tim Smith, co-owner of the Cary, N.C.–based residential development firm. “We went through, probably, 30 shopping center developers that just were not on our wavelength.” He and Preston Development co-owner Julian W. (Bubba) Rawl eventually found a match in Eco Group, a joint venture of North Carolina developers John Fugo and Kirk Bradley. Choosing the right partners is critically important, in view of the greater complexity and the longer timelines of mixed-use projects, experts say. Moving ahead on Mosaic, as the mixed-use project is called, the principals of Preston Development and Eco Group will be seeing a lot of each other over the next few years, Smith says. The 44-acre, $140 million first phase is to break ground by late this summer. Plans call for 200,000 square feet of retail and restaurants, a 120-room hotel, 335 apartments, 88,000 square feet of offices, a cinema, a day-care center and an amphitheater. All told, Mosaic will occupy 350 acres and cost a total of $800 million when the subsequent phases are completed, according to its website. In Rawl’s view, partners on such long-term projects need to be able to foresee and plan for changes that could occur in the future. “They have got to have vision,” Rawl said. “One of the things we liked about John and Kirk is that they are creative and see the way things are changing.” Smith, for his part, suggests that it is equally important to ensure that the personalities and operating philosophies of partners are a good fit. “Finding the right people — people who believe in the project and bring that to the table — is one of the key things,” Smith said. During the pro forma analysis and underwriting stage, newcomers to mixed-use can also face some new challenges, Garbus says. “Larger mixed-use deals may require a lot more capital than single-use projects,” he said. “So as developers start getting into mixed-use, they may find themselves pitching the deal to lenders or investors they’ve never worked with before. It’s important to make sure the pitch deck, financial projections and explication of the deal structure are lucid. You want the presentation to be impressive.” Given these complexities, it can be a good idea to make sure a member of the team, whether a joint-venture partner or an outside consultant, has experience in putting together mixed-use deals, says Garbus. Flexibility is always emphasized when Peter Melmed, managing director and national retail practice leader for Mill Creek Residential, meets with retail landlords to discuss collaborative work on mixed-use projects. “I tell them that we’re flexible and that there are lots of ways to structure these kinds of deals,” Melmed said. “It’s really whatever works.” These days Mill Creek, with a portfolio of 71 communities representing some 19,100 apartment homes in operation or under construction, is ramping up its deals with retail landlords eager to add residential to their malls and shopping centers, says Melmed. “They’re great deals for us, so we’re trying to talk to as many retail owners as we can,” he said. With respect to deal structures on mixed-use projects, notes Melmed, developers sometimes maintain separate interests and are not technically joint-venture partners. He cites Mill Creek’s role in building portions of the residential and retail within Edens’ 31-acre Mosaic District, in Fairfax County, Va. All told, the district comprises some 2 million square feet of retail, restaurant, office, hotel and residential space. Edens is the master developer and brought in Mill Creek and residential REIT AvalonBay Communities to build apartments. But all three companies independently own various buildings in the district, Melmed says. This past April Mill Creek announced the opening of the latest addition: the 222-unit Modera Mosaic project, a five-story apartment building with ground-floor retail. On other deals, however, Mill Creek will formally participate in joint ventures with retail or other developers. “In that approach, the retail property owner might own a piece of the residential building, and Mill Creek could own a portion of the retail,” Melmed said. “So we can do it both ways, either separately or together.” Mill Creek also develops mixed-use centers on its own, such as its Modera Avenir Place project, in Vienna, Va., consisting of a 125,000-square-foot, Harris Teeter–anchored neighborhood shopping center topped by 628 apartment homes. Service tenants there include a dry cleaner, some hair salons, a bank, an optician, an urgent-care facility and some restaurants. “We’re lucky to have a Metro station on that site as well,” said Melmed.